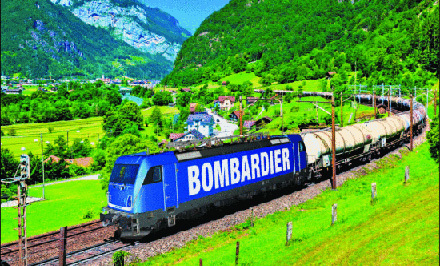 On 21 August 2018 Bombardier Transportation and CD Cargo, the freight subsidiary of Czech Railways, announced the signing of a purchase agreement for up to 50 of the newest generation of Bombardier TRAXX Multisystem (MS) locomotives. MS series locomotives can operate using more than one source of overhead electric power or only on diesel power as needed. The first delivery is for ten TRAXX MS3 locomotives. We are proud of the trust and confidence that our new customer CD Cargo has placed in our innovative TRAXX MS3 locomotive,” said Michael Fohrer, president of the portion of Bombardier that handles activities in the region. The TRAXX MS3 locomotive provides the so-called last-mile function, which enables it to bridge nonelectrified track sections found in ports or freight terminals. The function is similar to that available with the Bombardier TRAXX DC3 locomotive. This new multisystem locomotive will be equipped with the latest version of the European Train Control System, Baseline 3, ensuring seamless operation from day one. With this new order, 54 modern, interoperable TRAXX multisystem locomotives have now been ordered by Czech customers. CD Cargo’s first ten locomotives will be used for freight and passenger transport in the Czech Republic, Slovakia, Germany, Austria, Poland, and Hungary, while extending the fleet’s operability to Slovenia and Croatia. The locomotives will be assembled at Bombardier’s site in Kassel, Germany, with the car bodies coming from Wroclaw, Poland, and the bogies produced in Siegen, Germany.